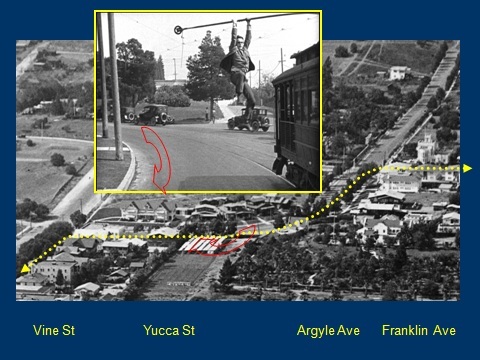 Harold Lloyd’s trolley stunts from Girl Shy. 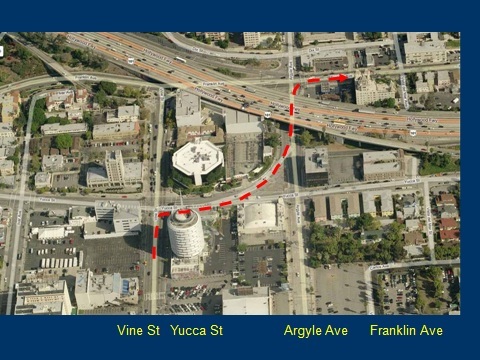 Filmed looking east as Argyle turns into Yucca. Following the great success of Safety Last! (1923), Harold Lloyd further cemented his reputation as a dare-devil comic with his first independently produced feature comedy Girl Shy (1924). In that film, Harold discovers the woman he loves is about to marry a bigamist, and in a frantic race to the altar, Harold dashes all across Southern California by every conceivable mode of transport in order to halt the wedding. During one sequence Harold finds himself hanging from the pole of a runaway trolley car. 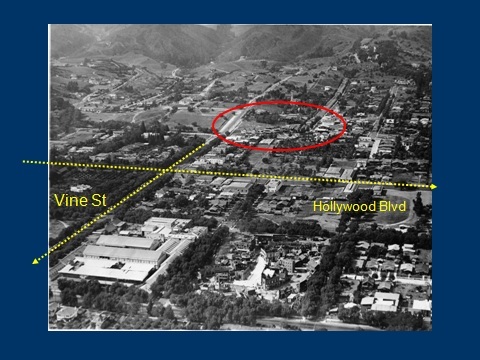 The sequence was filmed in a residential neighborhood just a block away from the famous intersection of Hollywood and Vine, along the route of the former Pacific Electric Railway, as it transitioned from running east-west along Hollywood Boulevard, to running east-west along Franklin Avenue, through a rapid succession of alternating left and right turns along Vine Street, Yucca Street, and Argyle Avenue. Lloyd’s crew filmed the runaway trolley sequence from various vantage points at each corner to capture nearly a dozen unique looking shots from this one setting. Here are static slides from the PowerPoint presentation you can download. 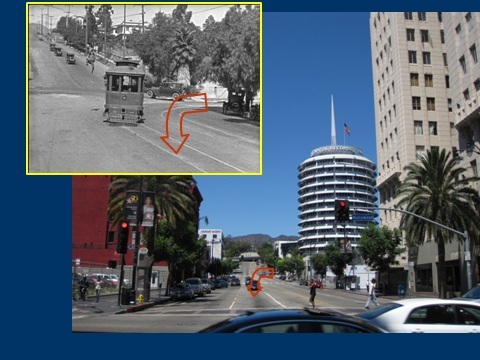 You can download below a 10.4 MB PowerPoint presentation showing a brief overview of where and how Lloyd filmed the Girl Shy trolley stunt in Hollywood. Most of the slides are animated, so wait a moment each time before clicking the “next” button. You will need a PowerPoint viewer to watch the show, and can download a free PowerPoint viewer at this site. 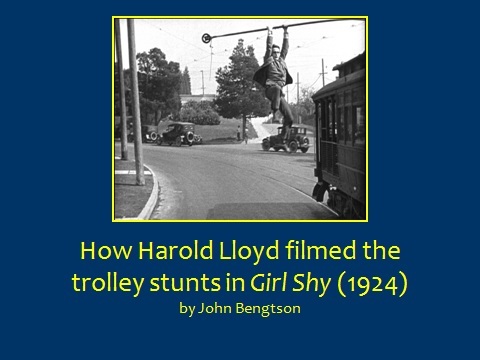 As with his stunt-work hanging from the clock in Safety Last!, audiences were generally unaware that Harold had only one complete hand when hanging from the trolley car in Girl Shy. As shown to the left, Harold’s incomplete right hand (he wore a glove covering a prosthetic thumb and index finger) prevents him from fully grabbing hold of the rope. You can read how Lloyd injured his hand, and resorted to a bit of movie magic when memorializing his handprints in cement at the forecourt to Grauman’s Chinese Theater, in this earlier post. My book Silent Visions documents Lloyd’s elaborate race to the altar in great detail, staged on the streets of Hollywood, San Fernando, Altadena, Palms, Culver City, Bunker Hill, Rampart Village, Fort Moore Hill, and downtown Los Angeles, as Harold commandeers automobiles, fire engines, motorcycles, trolleys, and horse wagons in his quest. The wedding was staged at Holmby House, now lost, the magnificent estate owned by retail magnate Arthur Letts, owner of Bullock’s Department Store. 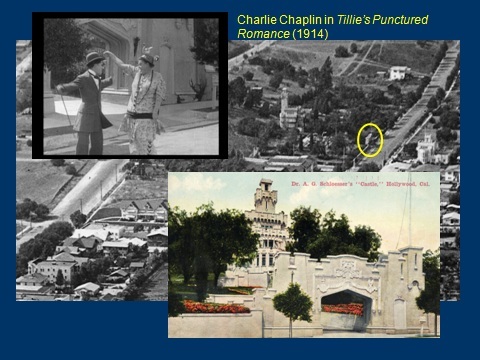 You can see where Harold filmed atop Bunker Hill in this later post. 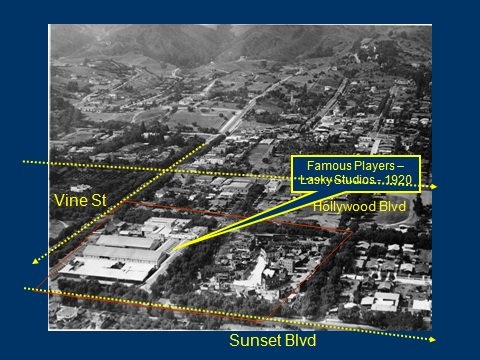 I am also posting here, once again, a tour of several silent-era Hollywood locations Harold Lloyd used in Girl Shy, and various other films, as well as the sites for the Lloyd, Chaplin, and Keaton Studios. 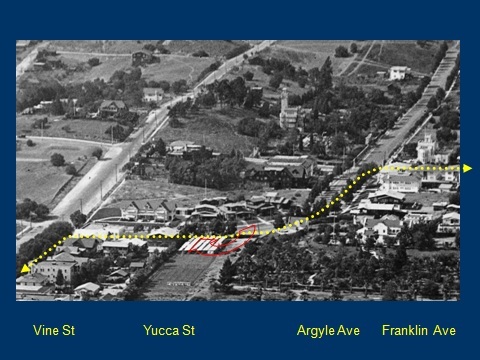 The site of the trolley stunts, along North Argyle and Yucca, on Google Maps. 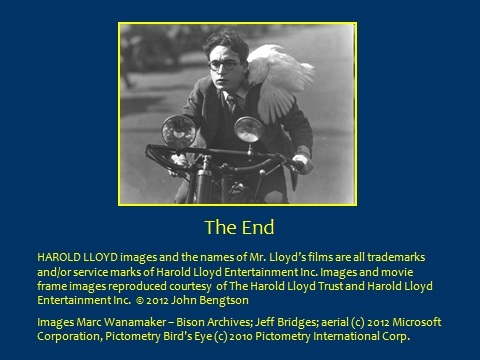 This entry was posted in Girl Shy, Harold Lloyd, Hollywood Tour, Lloyd Thrill Pictures and tagged Girl Shy, Harold Lloyd, Hollywood, Lloyd Thrill Pictures, Silent Comedians, Silent Comedies, Silent Movie Locations, Silent Movies, then and now. Bookmark the permalink. Great detective work and presentation, as always. Often in your work we can see remnants of past such as houses that have survived. But this one was ultimately a little sad for me since almost nothing seems to be left from 1924 except the street layout. 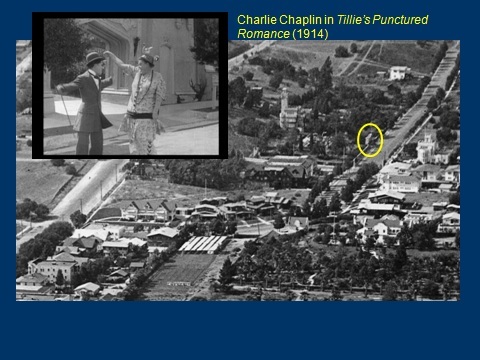 And the Hollywood of the ’20s was a much more pleasant looking place than today’s Hollywood. i have the comic collection. and i was wondering if anything like the homes or areas were still there? but the freeways and modern development have all but riuned that area, and hollywood. 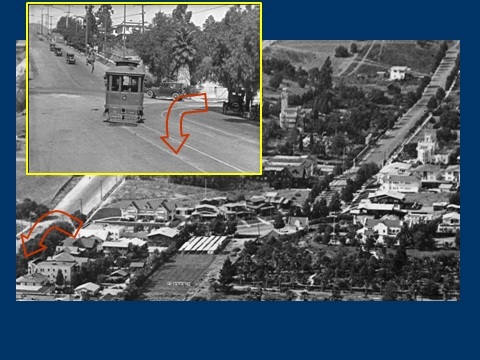 shy are all gone as is the Pacific Electric Trolly Car’s.